A painting by Miguel Chenier, a local artist in Cambridge Bay who makes beautiful paintings of the wilderness surrounding this community. Diamonds in the Ruff: a local organization dedicated to the welfare of dogs in Cambridge Bay. Donations go towards paying for abandoned and unwanted dogs to be flown to Yellowknife's animal shelter (rather than having them shot), and also towards bringing a team of vets up to Cambridge Bay once a year. A while ago, a hunter from our community was stranded out in a tundra for a few days when there was a white out storm. 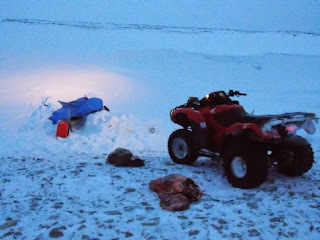 He had been out hunting caribou by ATV when the white-out hit and he lost his sense of direction, about 80 miles out of town towards Gjoa Haven. 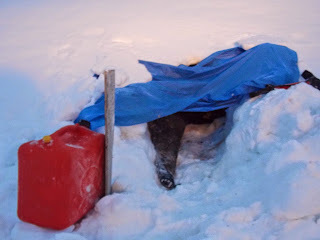 Once he realized he was lost, he decided to dig out a shelter in the snow with his shovel, and settle in for the night. He had a SPOT satellite personal tracker, a little device that notifies rescuers of your GPS location and status when you push a button, but he decided to wait until it was day before signalling for help, because he didn't want people searching for him in the night. The next morning, he set off the signal around 10AM. A search party was organized and sent out by 1PM, and by 8PM they had found him. He was home safe by 7AM. Thanks to his sharp survival skills (he actually is part of the Search and Rescue team in Cambridge Bay), he survived and was rescued. Once he was safe again, he did the community a service by posting photos on the community news page on Facebook with tips on how to survive in such conditions. Make sure you dig out a shelter that has enough room for you to move around a bit and stretch out. Pack an emergency blanket - you can snuggle in and feel warm, even in the middle of a storm. A list of things to pack in your survival backpack. I had a lovely chat with his wife one day who filled me in on more details. Carry a little portable stove with you to cook. Make sure you have tarp, which is key for blocking the wind. And if there's an animal nearby, remember that animals can sense fear. It was pretty impressive, to see how someone could survive in such harsh conditions with such little supplies. We all got sent home early yesterday because of the weather, and it just got worse over night. This morning, the offices and schools were closed. The winds were blowing so hard we could barely see across the street. It was -45 with the windchill, and all of the flights out of town were cancelled. Snow day! Usually that means we can just snuggle in our warm cosy house and watch movies all day while drinking hot chocolate. Unfortunately, we ran out of running water last night, which meant dishes would not be washed (yay!) and showers would have to wait (noooo! ), which was a little gross. But people have survived in the north for centuries, so we knew we'd figure it out too. We melted snow in a pot for water. That's when I discovered snow is really dirty and gross. Eventually we did find a place where we could use the washroom to shower, but we had to drive there. Through the blizzard. As we drove slowly down the street, I thought, why didn't Rob wipe the snow off the windshield? And then I realized that he did. We just couldn't see anything. Here are some photos of the blizzard. Most of it is just a lot of white nothing. For contrast of what things normally look like, I've included photos from other seasons. The dump is a good place to hang out during a blizzard. Halloween this year featured 80 km/h winds and a blizzard. It didn't stop the kids from trick-or-treating. It's hard to separate a kid from free candy. Some of the older ones made their rounds on ATVs and snowmobiles. The one kid that I admired the most was the ONE kid who came to my door. He looked about five years old, and he was bravely battling the blowing snow on foot by himself, making his way from door to door, while his parents watched from afar in a warm pickup truck. That kid deserves all the candy. Kids in the Arctic are of a special tough breed. They design their Halloween costumes to fit over their snowpants and parkas, and face the possibility that they meet meet a wolf or polar bear while trick-or-treating, and they do it anyway. As for me, sadly I'm a grownup and I can't go free candy harvesting trick-or-treating. Not that I ever did, as an immigrant kid. Instead we did what grownups do and gathered at a friend's house while dressed up as our favourite childhood characters, but in a creepy way, and gorged on a lot more chocolate bars than we really should have.